Why Won’t My magicJack Ring? The total REN for a subscriber’s line is simply the sum of the RENs of all devices connected to the line; this number expresses the overall loading effect of the subscriber’s equipment on the central office ringing current generator. The local telephone company usually sets a limit on the total REN, typically 5 or less. Basically, it means that some phones with higher REN’s use some of the electricity in the line to ring your phones. If the amount of juice needed to ring your all your phones exceeds the amount of juice available, your phones won’t ring. Before we had magicJack plus, we had an AT&T line. On this line we had an AT&T ‘trimline’ phone, a General Electric ‘big button’ phone and a panasonic cordless with several satellite phones. I originally hooked up all our old phones to the magicJack line, only to find none of the phones would ring. It should also be noted that REN comes in two flavors: REN “A” and REN “B”. So if you see a REN of 1.0B or 0.1B, no you’re not misreading at as 0.08 — it really is a B.
MagicJack has a maximum REN load too. Depending on the lot your magicJack or magicJack plus was made in, your device may have a load of as little s 2.0 to as much as 3.0. After recognizing this, the problem simply became figuring out which phones I prefer to keep and whether to buy new phones, most of which have ridiculously low REN’s. We dumped all the phones except the panasonic set and bought a corded GE big button phone with caller ID that I got at a yard sale for a couple dollars. I also found a cool cordless Columbo phone that had REN of 0.0B at RadioShack that we added and also use as our travel phone when we take the majicJack with us. 35 Responses to Why Won’t My magicJack Ring? Try a different phone with a lower REN. If that doesn’t work, try asking someone from outside your local area code to call you. Then try asking someone you know personally with a magicJack to call you. I am tring to use an ATT corded phone with a Ren of . We have been on chat with magic jack people yesterday and today for hours. They claim it is everything from our router to a defective phone. Another corded phone didn’t work either. We do have a cheap cordless phone that will actually ring on it. Why won’t a corded phone work with a magic jack plus? I have a corded phone connected to mine no problem. Make sure your phone is connected directly to the mJ+ and not to a wall jack. If the problem goes away, you’ve got issues with your wall jack. It may still be connected to AT&T at the NID on the side of the house. That would be bad. If all things fail you can get a phone number at Google Voice. This number will allow you to associate other phone #s with your Google Voice number so that those numbers will ring when the google # is called. At least that is how it is suppose to work. But when I call my Magic # the other #s I have associted with the Google Voice # ring. I can’t quite figure it out. I just accept the fact that I now am receiving a ringing notification of some kind when my Magic Jack # is called. I hope you can understand what I am saying. It costs a little extra, but yes, moving your preferred phone number to Google Voice is better than moving it to MagicJack, since magicJack charges you yearly for the transfer, but doesn’t charge extra yearly for a randomly supplied local number. I forward my google voice calls to the magicJack phone so I can answer them from the magicJack or Skype. It’s a little convoluted, but the end result is more and better options. This sounds like a magicJack usb-only device. You may need to check your audio settings. what does the audio setting have to do with the ringer. my magicjack was also not ringing so i changed the option on the main screen on the top left corner. i clicked on the “normal high speed” and it started to work properly. I’m assuming you’re talking about the USB version because the magicJack plus is not wifi-enabled, and there is no magicJack wifi version out yet. From what I understand, that option is to allow mJ to have more tolerance for latency problems (slow connections.) Thanks for posting your experience. Where did you see the option on the main screen on the top left corner? You said you clicked on the “normal high speed” and it started to work properly. Is that on the magic jack website or on the phone itself. I installed the magic jack app on my iphone and I had a similar issue, I could dial out but was not receiving any incoming alerts or ringing. I finally figured out the solution. the setting that needed to be changed was not on my phone or device but rather on the main mymagicjack panel.I think this solution might help anyone facing a similar problem.Heres what i did 1,)Log into your mymagicjackaccount on any pc with your user registered email and password 2.) check to see that your actual phone number is listed i=next to the device you are having an issue, If you see a number like *1762739273* instead of your phone number delete it and put your phone number there , when done log out, and now delete the magic jack app on the device that is having an issue. and reinstall the app.whether an iPhone,ipad etc. make sure your notifications are set to alert and it should be working now .My phone now works and rings when i get a call. the problem for me was simply when i downloaded and installed the app, i set a free number which was then set in my main user account. the problem is not with your instrument or its settings. please try what i have said and see if the problem is resolved. an Important note: make sure after making the changes on the mymagicjack,com account section ,you must now delete the app from your phone or device and reinstall it. I hope this helped some people get there iphone and ipads and devices in the issue of receiving calls. I had the same problem today (6/3/2016) but with the correct number showing on my account (I didn’t get a free number before). I deleted as you said and reinstalled it with the notification “on” and it WORKED. It rings for incoming calls as well as I get a notification. Thanks. For other users – never call majicjack support – they are useless bunch of jokers. Glad to hear it worked! I have a Magic Jack plus running about 8 phones in my home including a fax machine. How did I do it? I purchased a VIKING Ring Booster, model VK-RG-10A. It boosts both the volume and ring voltage and also allows you to switch polarity with an internal toggle switch which is important as some of the Magic Jacks have a polarity issue, they work ok with phones but don’t seem to do everything correctly. Anyway, in my basement where my old phone lines terminated and where my router is, I have the MJ+ with the power and ethernet attached. I run a short phone line out of the MJ+ into the Viking and then plug the phone line going to every line in the house into the VK-RG-10A . Every phone, fax and other contraption hooked to the phone lines in the house work perfectly (after I switched the polarity toggle inside the VK-RG-10A). The nice thing about the Viking box is that is also raises the volume of the call which is a problem if the MJ+ is pushing the signal over too long a wire. The viking box is small and about $180. Yes it is expensive but I was able to get rid of my second phone line 15 months ago so going forward the “MJ+VK-RG-10” is saving me money. Before I got rid of the second phone line I moved the # over to the MJ+ for $10 a year. I see many people just going to cell phones and getting rid of their house line. Even if you are not using the MJ for much, to hold onto the # for an additional $10 an year is pretty cheap until you figure out if you really want it. By the way, Viking has a smaller model that has a 5 REN capability but for me i was not powerful enough and it can’t witch the polarity that my MJ needed. I bought one, tried it and sent it back for the 10 REN model which worked great. The Ringbooster sounds like a great addition to any home phone system with larger REN needs. However, at almost $200, it dramatically eclipses that cost of the magicJack itself, making it less likely to fill the homes of those who are looking for a truly inexpensive alternative to a POTS line. I’d like to also point out that additional REN means additional electrical cost, and that while the additional electrical cost may seem trivial, it can really add up over the life of the booster device. For those willing to pay the price, it could be a decent solution to volume problems that seem to plague many a router-enabled magicJack plus. You wouldn’t be the first person to have this opinion. You also wouldn’t be the first person with legacy Embarq service to dislike the device. However your opinion carries less weight with me since you didn’t include your real name or a real email address. You should have little trouble if you’re using a reasonable ISP. Apparently Embarq got bought out by Centurylink in 2008, so I wonder if they might be the problem behind your dissatisfaction. Are they any good? If latency is a problem, that could be a reason why some people in Saint Paul, Minnesota won’t like VoIP devices in general. I hope this could be useful for some who have “MagicFeatures” installed. Thanks for the suggestion. I will share my experience with the not ringing issue. It takes more current to ring the phone than to carry the voice. The comments about the phone REN number is key, but so is the distance and amount of wire the signal has to travel through. When I plug into my home phone wiring to use the old jacks with devices it creates to much current loss & the phones will not ring. Use a cordless phone system with as many handsets as desired (I find the vteck brand works great). Use a short (10′ or less) & don’t connect anything but the base phone set to the magicjack – no line splitters. Don’t use a really old computer & desktops are better than laptops (more consistant 5v current to the usb port). Do this & you will be happy. The newer MJ’s that plug into the router may not have the issue that the old one’s like I have do. All true! We had such crummy phone lines when we bought our house I rewired them all with Cat5e before magicJack was even available. Cat5e and Cat6 cable carries phone signal better than standard phone wire. The magicJack Plus 2012 and 2014 and the magicJack Go all use a 5v AC adapter, so that becomes moot. It’s a good point that even modern computers don’t consistently have powered USB ports. Also Chromebook is incompatible with a USB-Connected magicJack, though ostensibly the browser could be used to activate and register the device using the “router” method. Thanks, Bill! Yes they do. I have a MJ Go and it worked for about 3 months, then suddenly lost its ability to make the phone ring. I can make calls but have no way of knowing if I have a call coming in. Michelle, does the phone have a “ringer off” switch? If so, is it in the off position? If not, have you tried using the phone with someone else’s land line or magicJack? Have you tried a different phone with your magicJack to see if it’s the magicJack? What has changed in your configuration three months ago? New ISP? New router? New computer? Have you moved? Is your account up-to-date? Have you checked with chat support to find out what’s going on? Is ringing disabled in your account? Can you make a call out, but not receive calls? Are the diagnostic lights on the machine working? Is your USB AC adapter burned out? Have you tried temporarily using a different 1-amp USB AC adapter, like the one from your cell phone or other small USB-powered device? Sorry for the late reply Ann. I suspect you may have a broken magicJack or a broken power adapter. I recently purchased a new Panasonic phone system (corded base with cordless extensions). I have it directly plugged into my Magic Jack; it works well – clarity and volume is good. However, it will not ring when an incoming call comes in. Using my mobile, I called my own MJ number (still no ring) and then picked up the phone – I could hear everything clearly, therefore I know that an incoming call works. I plugged my old phone back in and it would ring on incoming calls. I then tried using a line splitter so both my old and new phones are online; old phone rings, new one does not. 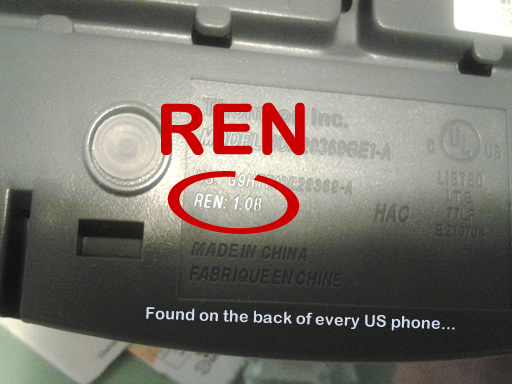 The REN # on the new phone is 0.2 while on the old phone it is 1.6. Any suggestions would be appreciated. Thank you in advance. Make sure both phones aren’t plugged in at the same time. Apparently, your magicJack has a super-low REN allowance. Does it ring with just the panasonic plugged in alone? Phone had not been ringing for about 3 weeks. No incoming calls either but was able to make calls. Chatted with MJ a few days ago. Good trouble shooting on both parties. Client has to be able to provide accurate information and follow the prompts suggested. Turned out I had inadvertently switched the phone to call forwarding in my account while trying to familiarize with MJ, making my cell phone ring instead!! Problem now fixed. Awesome that you were able to diagnose the problem! I recently purchased a MagicJack ‘Go’ phone. It plugs right into my Internet router.. HOWEVER, even in the instructions, it says to unplug your router ‘ONCE A MONTH’..?? I find IF my MJ home phone is not ringing, I reset the router and all is well..?? (I also found that just unplugging the phone from the router, then plugging back in works too.!!) They call it ‘Monthly Maintenance’…. A small price to pay for all the free calls..! magicJack Go or Express — What’s the Difference? Mac Update File has changed. I do not work for Magic Jack. This website is not affiliated with or endorsed by MagicJack, LP, YMAX Corp., or any affiliates. Any information provided here is at the discretion of this website operator. Designed by Laughter on Water.